1:00pm | Tomorrow morning at 11 AM, a new public art work is being dedicated. 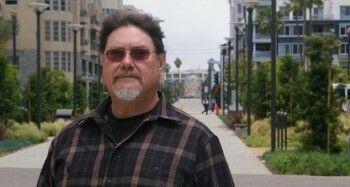 Craig Cree Stone, an internationally celebrated local artist and educator, recently completed the installation of Image Emergence: Promenade of Clouds, a mixed media work that includes stainless steel sculptures, site specific lighting, landscaping, perspective manipulation, and his signature cement staining process perhaps best known in Belmont Shore’s parking meter shadows. The work is part of a series of improvements to The Promenade that have taken place over the last several years, and was supported by the City of Long Beach, the Long Beach Redevelopment Agency, and the Arts Council for Long Beach. I interviewed Craig many months ago, when he was preparing to install the sculptural elements for the piece. I published a portion of our conversation, Craig Stone: Making Places Public, where we talked about public art. In this piece, Craig talks about his life. “I grew up in Riverside, California,” Stone said, “and I made things. My dad made things. We’d buy two cars and make one car, one that would work. I grew up in this context wherein my dad was a maker of objects, so I grew up making things. I also grew up making a lot of different things for different cultural purposes. I had a lot of mentors. “When I went to Cal State Long Beach, I didn’t know it was a good art school, actually. I went to Cal State Long Beach because it has a good American Indians Studies program. I knew a bunch of people there. They were all people I respected, and they’d encouraged me to go there. So, I went to school there but I had to declare a major because American Indians Studies is just a program. “There were a couple old guys who made furniture, and I went into a furniture program. It was called General Crafts. You would have to make something technically good and beautiful, or conceptually beautiful. Not necessarily ‘pretty,’ but beautiful in some conceptually complex way. And yet, they’d throw one of our friends, Kim Rutledge, who weighed about 200 plus pounds, on that chair and, if it broke, you’d get an ‘F.’ So, I liked that because I had to do a lot of the art and design things but, in the end, if it didn’t serve its purpose, then it didn’t work. It seemed like a more complex dialogue. I went through that program and I made a lot of artwork. “My project as an undergraduate,” continued Stone, “was to interview all these professors about the difference between student art and actual art. The next year I wanted to make representations of student artwork that functioned as student artwork, and my GPA went down. But I would grade all the projects. I researched the professors and wrote their comments, their typical comments, and would hand it in with the artwork. “Then, I created seven personas, each with a different ethnicity and a different gender. I made up resumes, and did these projects all over California. One is in the World Headquarters in the Bank of America building. They had huge galleries in the 70s and 80s. There were tax incentives for them to have that. “I had Craig Stone, Miti Nokogane, and Jerome LeRoy Washington, and I took the same body of work, the same series that I was working on, and would change the names and submit them under these names that would indicate your ethnicity and your gender. Jerome LeRoy Washington didn’t get in the show. Miti Nokogane got in the show, and Craig Stone got in the show. Miti Nokogane’s work, when they had the opening and the curators spoke, they were proclaiming how wonderful her work was. And then they proclaimed, at the same opening, that my work, Craig Stone’s work, was not as sensitive and very derivative, very influenced by Miti Nokogane’s work. “I worked under these different personas for several years, and then I disclosed it. I think it was in the LA Times that they said it was subtly subversive work that showed how notions of authenticity were tied to stereotypes and how, if you’re Jewish, you better be doing some smart stuff, and if you’re a female you have to reference certain materials and ways of working that are gendered. “At the end of it, by working through all these different personas, I came to some kind of interesting realizations about what mattered to me as an artist, even if I were working in these different personas. So, when I did my first Master’s Degree I made up a persona, Creestone (sp), which was kind of close to me, and made this body of work but didn’t show my own name, Craig Stone, until a few years later. So that was kind of my beginning. “That artwork would incorporate painting and furniture making and sculpture and installation. It was shown here, some in Long Beach, mostly in Los Angeles, and elsewhere. The reviews were always good because I was interested in continental theory and I was making things that referenced contemporary art at that time, post structuralism, deconstruction and things of that nature. I asked Craig to provide a specific example of one thing that came from the thesis that he created. “What I like to do is make representations of things that, in some way, function as what they represent. So, there’s the Krinski Building on Pine Avenue. If you look in there, there’s a lobby. That lobby is creating forced perspective. That was the first time in the City of Long Beach where you had an artist and an architect and developer collaborate to create a piece together. That room is built in forced perspective. Up on the top it says Ars Longa, which means ‘art is long.’ It has these pillars and the pillars are huge in the front and they get little, tiny, in the back. When you look in there it looks like that thing is huge. Here, I’m making a representation of a lobby that functions as a lobby. It functions as what it represents. “What I learned through the personas situation is that everybody is given a certain kind if profile, and then you make with it what you will. You have to make friends with that, you know? And yet, you get to change how you’re represented. You get to kind of move. “When I went to school I wasn’t an artist. I was the first person in my family to go to University. So, to me, that was all about pretending. You’re pretending to be something you’re not. At a certain point, you become an artist. This idea of things becoming… At a certain point, you’re representing something. At a certain point, you become what you represent. “I saw that as something that everybody has to negotiate with whatever they’ve been given. Then you’re engaged in this process of becoming who you are, despite all this other goofiness that people project on you. I was engaged in that. So many of us were first generation, had never gone to college, didn’t know anybody who had gone to college, and we were in the process of trying to figure this out. It really has to do with that time period when I was in school. “I would make things that looked like paintings of tables that were attached to the wall, and you would fold them out and they would actually work as a table. That’s why I got into public art. People said, ‘You know, your work seems to be integrated with architecture, with the wall. Seems to be interested in being as functional as an object, of being like a craft object, but it’s not a craft object, it’s really an art object.’ And that’s where the theory all plays in because people were looking at non-hierarchical ways of looking at things. “At that time there was this kind of idea that painting is painting, sculpture is sculpture, this is this, design is this. It’s kind of goofy that they’re all closed off as separate things. Why can’t they be integrated? And I think that’s what my generation was thinking a lot about. Are all these things related? Aren’t they more related to one another than they are different? Many thanks to Lee Adams for her excellent and speedy transcription services, without which, these 2 articles would not be possible.